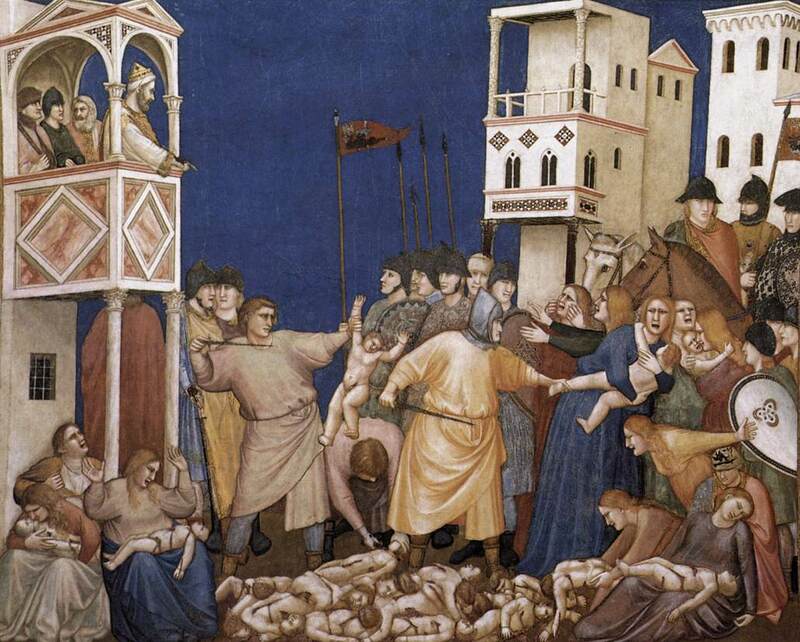 The Martyrdom of the Holy Innocents: Some accounts number them at more than ten thousand, but more conservative estimates put their number in the low dozens. 10,000 children or 1 child murdered is one child too many. The picture above is a painting by Giotto di Bondone (1266/7 – 1337). It is eerily prescient of the many pictures of the bodies of Jews in piles in the concentration camps. Their only crime was they were of the same religion as the One born this holy season. It makes no sense. Neither does any abuse of children sexually, physically and/or emotionally from Newtown to our town. Herod the Great was probably a functional atheist; he thought he ruled by his own right and authority. He was his own god as all dictators and tyrants vainly and terribly imagine themselves. We read a lot about the atheism of a Christopher Hitchens, but he pales to the tyrants. With no fear of God in the multitude of Herods, it seems in our days and centuries and it’s lack of the fear of the Lord, we are in the most functionally atheistic of all time. We do what we please. Children are expendable. We are own gods. Janning: Those people, those millions of people. I never knew it would come to that. You must believe that, you must believe that. Judge Hayward: Herr Janning, it came to that the first time you sentenced a man to death you knew to be innocent. The death of one man or one child makes it easy for the autonomous, ‘kingly’, ‘great’ self to kill more and more. Mother Theresa said, “… if we accept that the mother can kill her own child, how can we tell other people not to kill one another? Any country that accepts abortion, is not teaching its people to love, but to use any violence to get what it wants.” It took one Child to reverse the sin of Adam. The holy innocents unwilling death and the grief of Rachel, their mothers, weeping for them who are “no more”, fulfilled the Scripture that the Child of Mary would die as One for them all. 1 At that time the disciples came to Jesus, saying, “Who is the greatest in the kingdom of heaven?” 2And calling to him a child, he put him in the midst of them 3 and said, “Truly, I say to you, unless you turn and become like children, you will never enter the kingdom of heaven. 4 Whoever humbles himself like this child is the greatest in the kingdom of heaven. His love begins with one child, first protected by His Law, “Thou shalt not murder” and now by His Resurrection. The Child was called out of Egypt, God’s Son, so that all children could have His Kingdom by Baptism and faith. The Son, the Child called out of Egypt, the Exodus is His Body and Blood, circumcised on the 8th day, desires for all to believe in Him…and preventing them a millstone fastened around his neck and drowned is suitable. Out of Egypt, the Father called His Son, His true Son, who did not rebel, the Child born for us. The Lord became a child to make us His children and so we are; as Paul wrote in today’s Epistle, Galatians 4:4-7: our adoption as the Lord’s sons and daughters. The Child gives the childless hope, the loveless love, the faithless faith, in the great exchange: His health for our sickness, His love for us His enemies, His wisdom for the foolish to make us His own, His death for our life, His resurrection for our eternal life, so we are born again, His baptized to receive children, from day 1 to the 100th year, in His Name, baptizing them, as we have been by His grace alone, in the Name of the Father, and of the Son and of the Holy Spirit. Amen. Lucas Cranach the Elder (1472 – 1553), a painter at the time of the Reformation and a friend of the Luthers’, illustrated this distinction of law and promise. All Scripture ought to be divided into these two principal topics, the Law and the promises. For in some places it presents the Law, and in others the promise concerning Christ, namely, either when [in the Old Testament] it promises that Christ will come, and offers, for His sake, the remission of sins justification, and life eternal, or when, in the Gospel [in the New Testament], Christ Himself, since He has appeared, promises the remission of sins, justification, and life eternal. So much has been rightly preached and taught on the distinction between Law and Promise, but simply put: The Law kills the sinner (see the rich young man narrative in St. Mark 10: 17-22) and the Gospel makes alive (See St. Mark 10: 26-27). By His Law, we are found out(see Genesis 3: 9-10) and by the Gospel, Jesus Christ, the Lord finds us to restore His lost sheep, coin…son (see St. Luke 15). Lucas Cranach the Elder (1472 – 1553), a painter at the time of the Reformation and a friend of the Luthers, illustrated this distinction of law and promise. In terms of the arts, it is music that is most closely associated with the Reformation, but there was an outpouring of the visual arts as well. The idea behind this posting is from the blog, The World Wide Wolfmueller, blogger Pr. Wolfmueller, LCMS. I asked him to use this and he gladly said yes. Below is a black and white woodcut of Cranach the Elder entitled “Law and Grace”, full color above. It’s a great lesson with children and adults to find each of numbered images. There is a profound difference and Christ Jesus alone by faith alone through grace alone puts us into the picture by His grace to all through faith. Pr. Wolfmueller put numbers on the wood cut so we can identify each part of Cranach’s woodcut as illustration of law and promise. Use his woodcut for a class or for your family’s instruction to identify the various parts which are from the Bible. We read left to right, likewise, it is always Law then Promise, so that the sinner may daily take hold of Jesus Christ Who has taken hold of us all. 1. Adam and Eve, eating the forbidden fruit. Notice the snake wrapped around the tree. 2. Death and the devil, driving men to hell with the fear of death and the condemnation of the law. 3. That guy is you, goosed into hell because of your sin. 4. Here is Christ coming in judgment. Notice the flower (the Gospel) coming out of His mouth for those on His right, while the sword (the law) coming from His mouth for those on His left. 5. Moses, the lawgiver, holding the Ten Commandments. The Commandments are the verdict of our guilt and condemnation. 6. Hell, the desperate destruction of those who die apart from the blood of Jesus. 7. That’s you again, looking much happier on the Gospel side of the woodcut. 8. John the Baptist is preaching to you, “Behold the Lamb of God who takes away the sin of the world,” (John 1:29), and point to Jesus, dying on the cross for you. 9. Here’s a picture of Moses again, this time with the tabernacle. There’s a cross out front with the bronze serpent out front to which the people look and are saved (see John 3:14-15; Numbers 21:7-9). I think there is manna scattered on the ground. 10. Here’s the angel preaching to the shepherds and announcing the birth of our Lord Jesus. 11. Baby Jesus, descending from heaven to the womb of Mary. Jesus is bringing His cross with Him! 12. Mary, blessed by the Lord, pregnant with Jesus by the Holy Spirit. 13. Jesus on the cross, satisfying the wrath of God for all sinners. 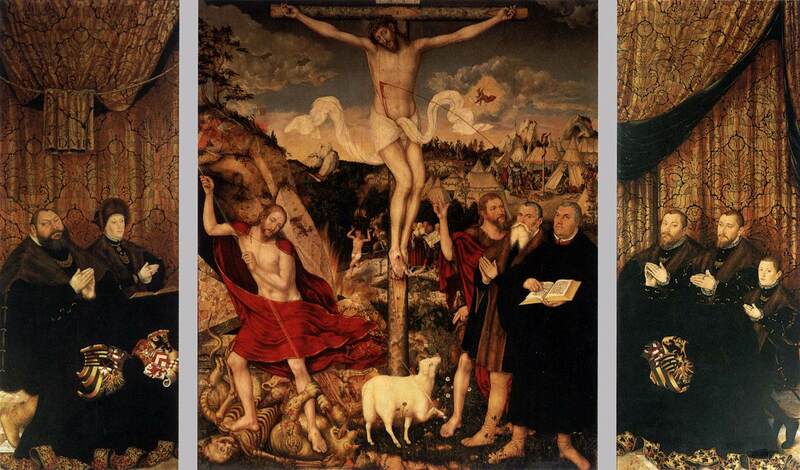 The Lamb in front indicates that this is a sacrifice, in fact, the atoning sacrifice. The Lord’s cloth is being blowing by the wind, indicating that the Holy Spirit brings the preaching of Christ to us. 15. The spear with which the devil was driving us to hell has been stripped away, and used against them. 16. The Holy Spirit brings the atoning blood of Jesus to you, in the preaching of the Gospel, in Baptism and in the Lord’s Supper. Here, in the Gospel, we have life and salvation. This is fundamental: Christ knows his sheep and, in turn, the sheep know Christ. It, therefore, follows that for the sake of faith, Christ alone should be preached to his little sheep, that he has given his life for the sheep and they are to emulate his example with works of love. A faithful preacher, therefore, should present nothing other to his people than Christ only, so that people learn to know him, who he is, and what he gives, and do not wander away from his word of promise, “I am the good shepherd, and give my life for the sheep,” but believe that he alone is to be esteemed as the true Shepherd and Bishop of our souls. That is what should be preached to the people, so that they may learn to know their Shepherd. Thereafter, then, we must emphasize the example of how Christ for our sake did all and suffered all, so that we, in turn, for the sake of the Word might willingly do and suffer all. Even as he carried his cross, we, too, should carry our cross. These two topics need to be preached in Christ’s kingdom. Whoever hears, understands, believes, and embraces it is a sheep in Christ’s fold and affirms: I hear and know the voice of my Shepherd, Jesus Christ, who declares: I died for you and rescued you from the wolf with my blood and death. Thus Christ speaks, and this I believe, and I know of no other shepherd. Moreover, and as a result, I do for my neighbor as Christ has done, and, if necessary, I will suffer for his sake, and if I am beaten for this, I remember that he also was beaten. His is the voice I hear, and I follow it. But if a wolf, the devil or a false teacher, comes and alleges that it isn’t enough that you believe in Christ and faithfully perform the routine, your vocation and station, but must run to St. James, become a monk, and so on, this is the ongoing pitch of the pope, that Christ’s words, “I am the good shepherd, I lay down my life for the sheep” are not sufficient; but people must be taught to perform their own good works like indulgences, alms, pilgrimages, the monastic life, and be careful to become their own shepherds and thus protect themselves. The little sheep replies: I do not know that voice; I hear a wolf, a devil, and a false teacher, each of whom wants to tear me from my Shepherd, Jesus Christ, and devour me; from them I flee away and refuse to listen to them. Luther’s examples here are in some ways dated. Yet, the pope has gained new prominence in the media age that trumps personality over character as quasi-divine. Pope is a man-made office. It has no divine institution behind it. His pitch is still works-righteousness to the point that the current pope has said about non-believers, “If they just do good, then they will go to heaven”. If that is so, then the Lord Jesus was crucified for no good reason. And there are other “popes”: televangelists, mega-church pastors and the like who all have an “ongoing pitch”: if you just buy into my theology, buy my book, do what it says, then God will be with you. Never trust “If, then” statements when it comes salvation. Beloved in the Lord, don’t run to your rosary, your spirituality“your best life now”, “your purpose driven life” and all the false prophets: they will not cover your sin with the blood of Jesus. Run to your Good Shepherd. As Luther preached above: you do not have to become your own shepherd. As Jesus preached and His preacher Luther reiterated, The Good Shepherd has called you. A week from tomorrow is October 31st, the Feast of the Reformation. The blessed Reformers were very much concerned with the preaching and teaching Office of Pastor. Priests at the time were beating congregations down with the Law, both God’s and man made churchly rules and regs that by them we can attain heaven. It was a curse. Pastors are called as ordained Servants of the Word so that the Gospel of Jesus Christ and His single-Handed salvation of us all be preached for the increase of saving faith. James further writes that with the tongue we bless the Lord and curse our neighbors. James was encouraging his brother pastors to be clear in preaching the Word, rightly distinguishing Law and Gospel so that a “harvest of righteousness” come to fruition in the making of “peace” (verse 18), God’s peace which surpasses all understanding. Almighty God, grant to Your church Your Holy Spirit and the wisdom which comes down from heaven, that Your Word may not be bound, but have free course and be preached to the joy and edifying of Christ’s holy people. In steadfast faith, we may serve You and in the confession of Your name, abide to the end through Jesus Christ our Lord. Amen.